The Elvis Server admin pages can be used for performing maintenance tasks and monitoring activity. The pages that are available and the options they contain depend on the version of Elvis that is installed. Server status. 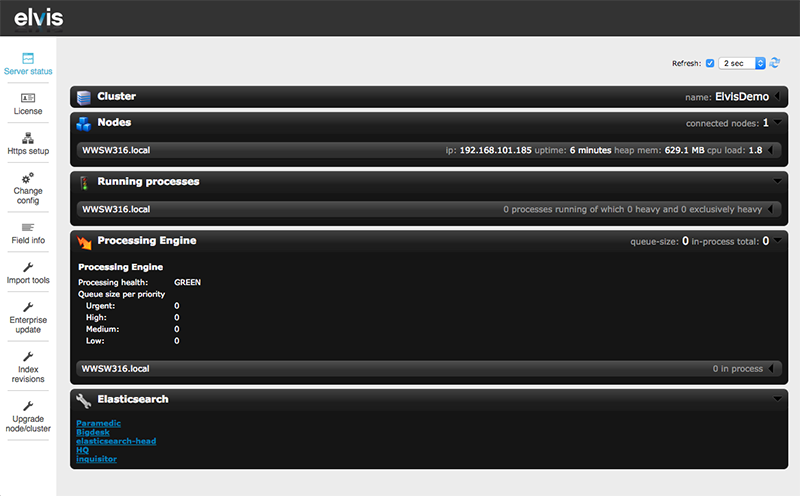 The Server status page gives an overview of the current status of Elvis Server. Use it to monitor the various components such as clusters, nodes, running processes. License. The License page is used for managing server and client licenses. See Licensing Elvis 5 Server. HTTPS setup. The HTTPS setup page is used for setting up communication between the server and the clients using a secure HTTPS connection. See Setting up HTTPS in Elvis 5 Server. Change config. The Change config page is used for changing the configuration of Elvis Server. See Changing the Elvis 5 Server configuration for a running cluster. Field info. The Field info page shows the information for all metadata fields. See Metadata field information for Elvis 5. Support tools. The Support tools page provides an overview of the configuration of Elvis Server. Info: This page is available in Elvis Server 5.16 or higher. It can be used for support ends to quickly check if the Server configuration is as expected and to download various files and folders for troubleshooting or reference. See Using the Support Tool page of Elvis 5 Server. Import tools. The Bulk Import tool is one of the ways of importing files in bulk into Elvis 5. See Importing files in bulk using the Bulk Import tool of Elvis 5 Server. A new and improved Import tool is available in Elvis 5.17 and higher. See Importing files in bulk using the Import tool of the Elvis Management Console. This tool has been removed in Elvis 5.27.9. Please use the Import tool that is available in the Management Console. Enterprise update. The Enterprise update admin page is used to update all Enterprise objects which are linked to Elvis. See The Enterprise Update admin page in Elvis 5. Index revisions. The Update index page allows you to manually update the Elvis Server indices. See Updating the Elvis 5 Server index. Upgrade node/cluster. This page is used for running specific upgrades. Recover misplaced asset files. Recovers assets that are stored in the wrong file store. If an asset is missing the tool will search known file stores for the misplaced asset. When none are found the tool will show a warning in the log for further investigation. Relations upgrade. Rebuilds Collections and fix broken asset relations. Enterprise relations upgrade. Rebuilds Enterprise relations that were incorrectly set during migration. 21 August 2018: Changed title from 'Server admin pages in Elvis 5'. 21 August 2018: Reviewed and restructured the article.